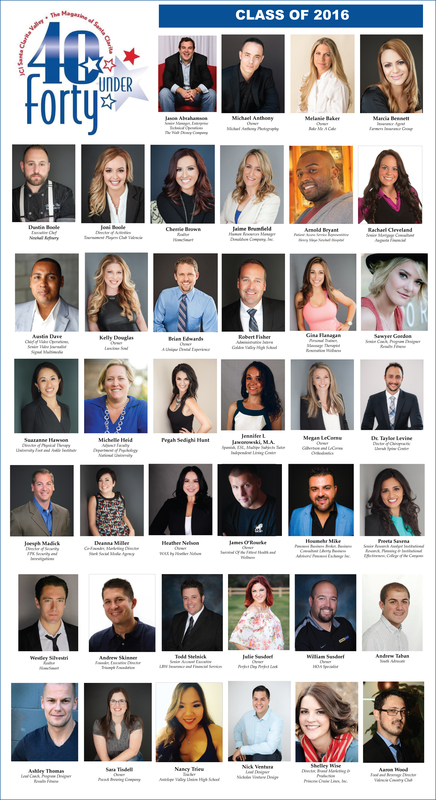 JCI Santa Clarita and The Magazine of Santa Clarita are proud to announce the 2016 class of SCV’s 40 Under Forty. Following a public nomination period, the 40 Under Forty Selection Panel chose honorees from a pool of 75+ nominees who best represent their business and/or community through exemplary leadership. Join us for the 40 Under Forty Awards Gala on Friday, September 23 on the beautiful Valencia Country Club event lawn to celebrate the next generation of local leaders. We will also honor our longstanding community partners, The Magazine of Santa Clarita and the Santa Clarita Valley Chamber of Commerce. It’s a night you surely will not want to miss! Recognition of these deserving young professionals would not be possible without our sponsors: Platinum Sponsor SCV Chamber of Commerce; Silver Sponsors Chiquita Canyon, Curt Kravitz Bay Equity Home Loans and Houmehr Panoussi – Liberty Business Advisors; Bronze Sponsors Abi Caruthers of Love Weight Loss, and Results Fitness; Photography Sponsor SchlickArt; In-kind Sponsors J&M Entertainment and A-1 Party, Sol Graphics, 24/7 Events, Optimus Computing, SLD Awards, Valencia Country Club and New Leaf Training. For more information, please visit www.scv40underforty.com.